Yentl at Theater J, Post-Show Panel on Women and Religious Tradition | "A Song Every Day"
Posted on September 8, 2014 by vspatz	in Events, Gender, Women in Judaism and tagged I.B. Singer, Jill Sobule, Leah Napolin, Shirley Serotsky, Theater J, Yentl. Theater J’s new production of Yentl, based on Isaac Bashevis Singer’s short story, explores issues of gender and religious tradition. Panel discussions following Sunday matinees extend the conversation. Tickets: Visit Buy Online or call Box Office Tickets at 800.494.8497. Find out about ticket discounts here. SPECIAL OFFER: Use coupon code ‘YENTL10’ and save $10! Buy online or call and mention the code. September 14 panel, post-matinee, approximately 5:30 p.m.
As a girl in 19th Century Eastern Europe, Yentl is forbidden to pursue her dream of studying Talmud. Unwilling to accept her fate, she disguises herself as a man. 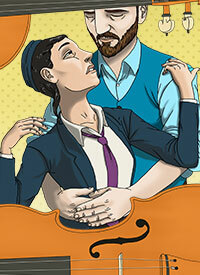 But when she falls in love, Yentl must decide how far she’s willing to go to protect her identity. Invigorated with a bracing klezmer/pop/rock score from Jill Sobule (the original “I Kissed a Girl,” “Supermodel”), Yentl asks up-to-the-minute questions about gender and sexuality.